Divergent Plate Boundaries are where tectonic plates are moving away from each other. Examples are mid-oceanic ridges and rift valleys. 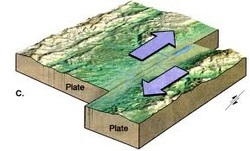 Convergent Plate Boundaries are where tectonic plates are moving towards each other. The can produce mountain ranges, subduction zones, volcanic island arcs, and continental volcanic arcs. Transform Plate Boundaries are where the tectonic plates are sliding past one another, without creating or destroying crust. The San Andreas fault, that is the boundary between the North American and Pacific Plates is one example of a transform boundary on Earth's surface. Convection Currents- caused by the very hot material at the deepest part of the mantle rising because it is less dense, then sinking as it cools and becomes more dense. This cycle repeats over and over within the asthenosphere part of the mantle. 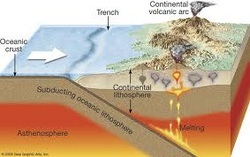 Oceanic Crust- The crust on the surface of the Earth that is typically below the oceans. It is thinner, though denser than continental crust. Continental Crust-the layer of granitic, sedimentary and metamorphic rocks which form the continents and the areas of shallow seabeds close to their shores.